Bitopia is a trading robot claiming to help investors make high profits out of cryptos, forex, and CFDs trading. This app is said to earn traders between 2% and 10% return on investment per month. Sounds good right? However, we’ve reviewed Bitopia, and found it to be a scam. Our Bitopia test took into account rigorous tests and feedback from traders with firsthand experience. Keep reading to learn why you should keep away from this trading robot. Is Bitopia Scam or Legit? InsideBitcoins Verdict! Bitopia appears to be a scam given that it has few online reviews most of them negative. This trading robot is not listed on TrustPilot. This trading robot does not provide enough information about the founder and the team behind it. Unlike legit robo-traders, Bitopia does not provide any information about its technologies and the rationality behind them. Open an account with this verified trading robot today and start earning real profits. What is Bitopia, and is it a scam? Bitopia claims to be a robo-advisor that helps traders make considerable profits within a month trading crypto, forex, and CFDs. This robo-trader is said to help inexperienced traders make money from the mentioned markets without having to have any background in these areas. Unlike most robo-traders, the Bitopia approach allegedly copies trading signals from top crypto, forex and CFDs traders and executes them automatically. The robo-trader also claims to offer robo-advisory services including portfolio management and related services. Clients are required to specify their investment goals at the beginning of registration after which the Bitopia team prepares an investment strategy for them based on their risk appetite. As mentioned previously, Bitopia provides vague information about the founders and the team behind the robot. While there is a video on their website showing some team members, it does not give their details including names and qualifications. Also, the explainer video does not offer any information about why the team is best suited for the app. InsideBitcoins recommends that you stay away from this robo-trader and any other that does not give details about the founders and the team. It’s a no brainer that any founder of a good product would not shy away from letting the world know that it is through their hard work. A product owner who does not want association with their invention is likely ashamed of their work or is hiding something and does not want to carry the burden when what they are hiding comes to light. Bitopia case is even more complicated given that they are not ready to disclose their partner brokers. Their customer service is also not transparent given that clients must ask for a call back to speak to one of their agents. InsideBitcoins has established that Bitopia does not answer all call-back requests especially those probing on their legitimacy. Zero information about founders and the team behind the app. No disclosure of partner brokers. Customer service not always reachable. InsideBitcoins have analyzed Bitopia basing on the above and other metrics and find it suspicious. First, their website is poorly built and does not provide much detail about the founders and their backgrounds. Bitopia also focuses very much on bait marketing and provides little information about its technologies. Also, this robo-advisor does not have many online reviews and the majority of the few that are there report that it is a scam. However, given that the robo-trader has only been around for a few months, it would be unfair to conclude that it is a scam. There is a high chance that they are legitimate only that they have not been able to define their approach with clarity. InsideBitcoins didn’t find any information about when Bitopia was founded which, is a big red flag since there is no way to prove their track record. Also, we did not find any details about their physical location. This is unlike most well-established robo-advisors. Bitopia has also not disclosed about the broker behind its app, which is another big red flag. All trading robots operate under a broker whose responsibilities include trades execution as instructed by the bot and transactions facilitation. A robo-trader cannot operate successfully without the backing of a good broker. Bitopia claims to use computer algorithms to assess investors, scan the markets for opportunities, and match these opportunities with the investor risk appetite. The robo-trader also depends on trading signals to inform forex and CFD trading decisions. Additionally, the so-called robo-advisor provides automated portfolio management services to its clients. When it comes to Bitcoin and other cryptos, the Bitopia app claims to analyze the markets big data and execute trades with an accuracy level of about 99%. In traditional human-driven investments, the degree of accuracy is below 25%. In general, robo-advisors are less costly when compared to the fees charged by human advisors. Top robo-advisors such as Betterment, Vanguard, and Wealthfront have a transparent commission charging mechanism and human, financial advisors ready to offer support to clients who may need someone to talk to. Bitopia does not disclose how it makes money and has no well-defined platforms let alone a face that can be held accountable in case of deposit loss. Also worth noting, unlike well-established bitcoin robots such as Bitcoin Code and Cryptosoft, Bitopia offers a myriad of services despite not showing the capacity to execute them. This is another big red flag that this trading robot is a scam. 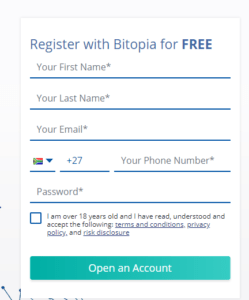 InsideBitcoins has established that the Bitopia registration process is an easy one. However, this is not to mean that we recommend this robo-trader. It is essential that traders conduct enough due diligence before trading with them. The first registration step with this robo trader involves filling in details such as full names, email address and phone number in a form provided on the first page of their website. 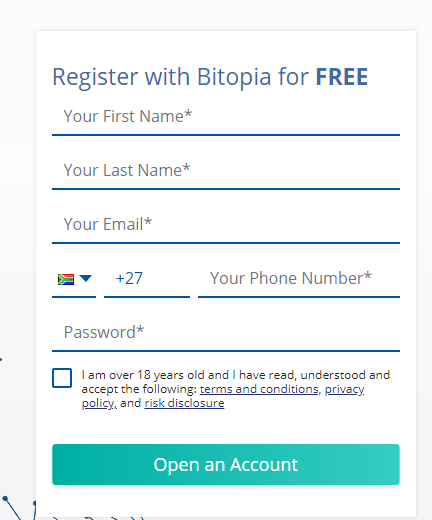 While Bitopia has questionable activities in other areas, we can confirm that its website is secure and has a strong password policy. The site is Secure Socket Layer (SSL) secured which means that any data transmitted between the client and the server is encrypted and therefore can’t hackers cannot steal it. Also, the Bitopia password creation process requires a mix of letters, numbers, and symbols, which is what is recommended by security passwords. Most cyber attacks happening today are as a result of poor password practices. Fill in details in a form provided on their website. Keep it in mind that there is a big possibility that they are a big scam. After successful registration, traders are required to deposit to start using the trading app. Bitopia requires a minimum deposit of $50 to begin trading. This is way below what most robo-traders in the same category ask for. It is important to note that the minimum deposit required to start trading depends on the underlying broker. Bitopia claims to partner with multiple brokers but has not named them. The available deposit methods include Visa and MasterCard and also Bitcoin and Ethereum wallets. Most robo-traders including Bitcoin Code and Cryptosoft provide more options than these. InsideBitcoins recommends that you approach Bitopia with caution and only make deposits when you are sure about their legitimacy. Our tests leave a lot of unanswered questions about this trading tool, and therefore we cannot recommend it. You can browse through this page to learn more about trading robots and and read comprehensive reviews about the leading ones. Unlike most leading trading robots, Bitopia does not offer a demo account. Immediately after making the deposit, traders receive instructions on how to integrate the trading app into their trading account. The lack of demo account appears as a red flag to us given that there should be a way for a client to backtest the robot especially when it comes to forex and CFDs trading. While it is not out of the ordinary to find a bitcoin trader without a demo, it is unheard of in forex and CFD trading. While we do not recommend this platform, if you do choose to test it for yourself, we recommend that you start small preferably with the minimum amount required. InsideBitcoins recommends that beginners start with a small investment. InsideBitcoins finds live trading with Bitopia very complicated and not fit for traders with beginner level experience in crypto, forex, and CFDs. The trading platform borrows much from the MT4, which is the industry standard third-party software for forex and CFDs trading. However, Bitopia does not incorporate it well in its trading platform a thing that makes trading with them a bit hard for beginners. This robo-trader does provide guides to help traders navigate through their platform but still, beginner traders may struggle to wrap their heads around the instruction materials. It is important to reiterate that Bitopia is slightly different from other trading robots in that it does depend on MT4 signals to inform trading. This approach is known as social copy trading and involves automatically copying and executing the trades of superstar traders. Most trading robots depend on sophisticated algorithms to analyze the markets big data and execute trades. Bitopia does depend on such algorithms but not entirely. When it comes to returns, this robo-advisor guarantee between 2% to 10% per month basing on the trader’s risk profile. When compared to specialist trading robots such as Bitcoin Loophole or Cryptosoft, the returns that Bitopia would generate if it were legit (which after verification we can confirm that it is not), would not even be worth the risk. While Bitopia offers miniscule returns, you can expect to make over $1,000 USD per day with an investment as little as $250 with the reputable robots we have recommended above. Bitopia will simply not generate the returns on investment that the other robots will. Given the risk and the high likelihood that this robot is a scam, we do not think trading on trading on Bitopia is a good use of time or a profitable investment. 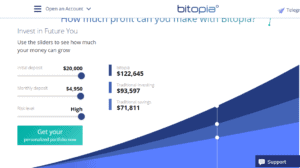 Have People Made Money with Bitopia? InsideBitcoins recommends that you stay away from this robo-trader. Firstly, they are very new in the industry and have not been able to define their offerings well and secondly, there are a lot of complaints about people losing their investment capital. This goes without mentioning that they are more focussed on making promises than in improving their trading infrastructure. Also, they have not disclosed the founders, the team behind the robot, and their partner brokers. We find this a huge red flag given that there is no one to be held accountable in case of traders deposit loss. Additionally, traders have a right to know the underlying brokers before depositing so that they can make informed decisions. Bitopia also fails to provide a clear customer service channel of communication opting for email, a live chat and a call back request. InsideBitcoins finds it absurd that they do not provide phone lines and have no physical offices. Scammers often avoid lines of communication that can be traced back to them often preferring callbacks since they can call with untraceable lines. This may be the case with Bitopia and it is therefore recommended that you avoid trading with them. In a nutshell here are the reasons as to why you should not trade with this broker. Have no traceable offices or lines of communication. Not transparent on the people behind the trading platform. The few online reviews available are complaints about people losing investment. What makes a legit trading robot? Perhaps the best question to ask here is what defines a legit trading robot. Experienced robo-traders agree that transparency is the first measure of how dependable a trading robot is. Scam trading robots are likely to give a lot of vagueness regarding the founder or the founding team and the technology behind the robot. Additionally, their marketing techniques are likely to show signs of a pyramid scheme. Another thing worth noting is that scam trading robots are likely to have fewer or no reviews even though those that have been around for long can have many reviews but 99.9% of them reporting a scam. Scam trading robots are also likely to invest little in branding and focus more on hype marketing with false promises and unnecessary pressure to make deposits. Moreover, most scam robo-traders are likely to adopt a name that is almost similar to another reputable company in the same industry to trick clients. InsideBitcoins recommends that you only trade with a verified trading robot. Here are some of the questions you should ask yourself when choosing a trading robot. Are they transparent about the founders and the team behind their trading platform? Do they have well-built platforms? Do they implement safe cyber practices? Are they engaging in misleading marketing? Our comprehensive tests have revealed that Bitcoin Code, Bitcoin Loophole, Bitcoin Compass, and Cryptosoft are the most reputable trading robots on the market today. Unlike Bitopia, Bitcoin Code has genuinely helped people make money as is evident with the many online reviews. So if you’re interested in a legit robot that will make you real profits, try Bitcoin Code by clicking the link below, or read our Bitcoin Code review here. Is Bitopia a Legit trading platform? InsideBitcoins finds Bitopia a bit suspicious and recommends that you approach them with caution. This robo-trader does not disclose the founders and the team behind it which is a big red flag for a scam. How much can I make with Bitopia? The expected return per month with this trading robot is between 2% to 10%. This is slightly higher than what you get through traditional investments and savings. Most specialist robo traders such as Bitcoin Code guarantee a return almost ten times that of Bitopia. Is it risky to trade with Bitopia? Bitopia categorically states that there is a risk in trading with their app. The higher the risk, the higher the returns. This robo-advisor measure the risk appetite of each trader to determine which investment is fit for them. How much does Bitopia cost? Bitopia is a free tool, but the underlying broker may charge a brokerage fee. The amount charged depends on the broker. InsideBitcoins recommends that you do a thorough analysis of the suggested broker to determine if they match your trading goals. It is a worthless software to use for trade. It’s a total scam! The Bitopia is a very poor and less understandable platform. It is very difficult to trade with this software and I was unable to understand the way the system works not to talk of making a dime from the site. I think I need to know if I can withdraw my money or not as I still have some cash there. Also, what are the trading robots that you will recommend for me to use as a beginner? Is there a withdrawal policy on the bitopia software? 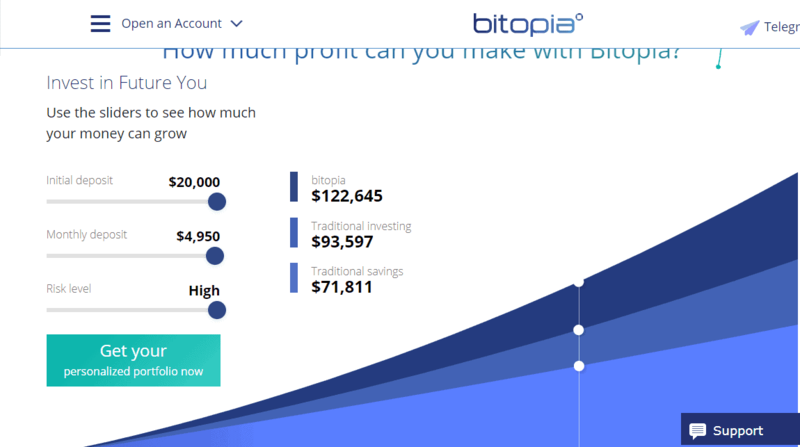 How much can I make from an investment daily on Bitopia? Hello Nana, we are sorry to hear about your experience. Bitopia appears to be a scam and has a very sketchy withdrawal policy. It would be almost impossible to withdraw money from this crypto bot because they move the money to another account as seen as it is deposited by unknowing users. We would recommend you to invest in Bitcoin Revolution. I could not stop laughing when I made use if the application, virtually all its comments were negative with none of the users having a good response for the crypto robot. If you want to have a good trading experience, do not go for this, you will surely become discouraged even to take part in any worthwhile crypto robot. Considering the fact that there are hundreds of cryptocurrency robots (both legit and scam) out there, I think it will be great to know the best ones that can aid my trading with ease. What is the best crypto robot that you will recommend to me as a newbie? What do you the Bitopia founder wants to achieve with what they started? Hello Pretty, as you are a beginner, it would be very helpful to conduct some research before investing. However, to make this part easier for you, we have done a lot of research and analysis on popular bitcoin robots and these are our highly recommended ones.